Suzanne Ackerman-Berman has been changing lives in South Africa for decades. In 2015, she became Patron of Flower Valley Conservation Trust – combining her focus on supporting entrepreneurs with her love for nature, and especially fynbos. Suzanne is also the Director of Transformation at Pick n Pay. Here she provides mentorship and support to up-and-coming entrepreneurs, helping them to play a meaningful role in South Africa’s economy. She received her tertiary education in Cape Town (the University of Cape Town), as well as in Chicago. After that, Suzanne worked in cities around the world, running restaurants. As the daughter of Pick n Pay founders, Raymond and Wendy Ackerman, Suzanne finally returned ‘home’, and worked her way through the Pick n Pay ranks, until she found her passion in running the Transformation portfolio. 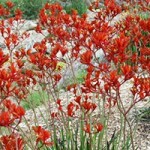 While she loves working with people, she also loves and appreciates nature – in particular flowers. 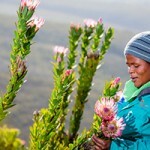 As Flower Valley’s Patron, she connects with fynbos as often as possible. And of course, she loves reading books on flowers (in particular gardening). And so her motto aligns with Flower Valley’s vision, as Suzanne actively helps to ensure a fynbos-filled future for life and livelihoods. We are situated between Stanford and Gansbaai, in the Western Cape, South Africa.